I thought by the time I was releasing the announcements of yesterday's Newsletter that I had improved somewhat. Happy Birthday today to Jerry Baker Cobb ('66) of VA! We hope it's a good one, Lady! and was very happy! My mother informed me I was going to Warwick Jr. High, NOT NNHS! up on the later stuff as well and attend his reunions. to tell her I graduated from WHS! Joe likes the picture and it hangs in our living room. how, ol’ WHS ’61 will have one! that my close friend, Wayne Karmosky ('65), lived in. Oh, WOWZERS!!! I did not know that, Henry! I'm looking forward to seeing you both soon, Cousin Henry! (colors and sizes, etc. ); not to mention a bit of fraud! I never knew how little I know about what I knew I didn't know. know. I thought I was having some good humored "fun" with our HHS friends; boy, the things I don't know? a cursory reflection on arrows, Romans, times, the class of 1902, and other stuff! me what'd I say, tell me what'd I say right now..."? No, that's not a "plug" of tobacco, that's my tongue in my cheek! R. Wayne Stokes, newly educated, sorta! Ah, you can only imagine the things I might have told you had my head been clear! The mind boggles! Gloria (Woolard Price - Hampton HS - '65 - of FL)…..you’re SO right about Crum’s location. there was at one time a bakery with the delicious pasties I mention but your right, it wasn’t Crum’s. BAKERY? Please prove that I’m not crazy. daughters who were in my class at Hampton. reunion although he was Class of ’62. To David from Midnight the Cat – Plunk your magic twanger, Froggy. And Carol…….you’re still VERY bad. And yes, Chandler Darlin', I know I'm still very bad. My sister says I've always been that way. don’t remember where your parents lived in Richmond. on such a subject) to Dave Arnold ('65 - 0f VA) on the phone last week. tidbit, they put a contract out on my daddy in order (so they thought) to force the governor into setting them free. Bill was a Marine, and you didn't get far trying to blackmail the man. But the point is, whether Beryl knew your mother at JMHS or not, my daddy almost assuredly knew your grandfather! Thanks, Pauline! See you soon! not known for sitting in one place too long. Needless to say I didn't follow all the rules. Shopping Center, with McDonald's and Costco. Thank you, Cathy, but not to worry - I'm the biggest bum I know. gone, while growing up. I bet it takes you most of each day and part of the night to put the newsletters together. buns off with updates later! Thanks so much, Dee! Believe me - I took some time off! I had no other choice! of images, links, and multiple postings on the site which are involved. I'm looking forward to helping you with your reunion! I LOVE REUNIONS!!! weeks away!!! How am I gonna go dancing NOW?!?" Do you want to start a page on Home Remedies...because I COULD WRITE A BOOK ON THAT SUBJECT! Raw cookie dough... mmmmm - my favorite food....mmmmm - Oh, I'm sorry, Jean, what were you saying? Oh, yes, the liquid yummies! I'll post all that on those Pal and Nostalgic Artifacts pages when my brain clears. We look forward to your new book. Thanks, Jean! See you soon! could be a "Five Pointer". Some years she just said "forget it...you are healthy...you never even have a cold". Those years I could not be a five pointer. classroom to drink extra milk! Can you believe that? Of course we had room checks and curfews in college...that was another planet I believe. chin-ups, tumbling and apparatus were the only things in all of PE that I could do! Thanks, Jean - I think (GIGGLES!) - for the memories! 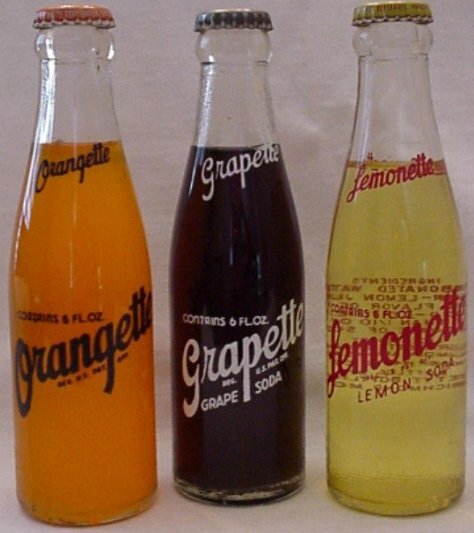 attached great picture of Orangette, Grapette, and Lemonette to add to your nostalgia page. The image is from http://www.vaiden.net/orangette_grapette_lemonette.jpg. site more fully. I'm still operating pretty much on automatic pilot..
found. The man is absolutely magical. I posted that great image - thanks again! dressed in a two piece suit, with no hands. One of the businessmen asks the fellow passenger: "Korea?" (suspecting both hands had been amputated from a war injury). No, was the reply..."Robert Hall". OK, it is a sick joke, but it is the only Robert Hall Clothier joke. YOWZERS!!! Thanks, Adonis! I posted it on the Robert Hall page. What else could I do?!? GIGGLES!! Oh, and Wayne Honey - Joe "painted" that signature himself! GIGGLES! all better. I don't know how you do it.........I get tired of sitting at the computer even for an hour. You're the BEST!!! and Robert , but I'm sorry I don't have any info on them. not sure you can walk five steps without losing consciousness again, well, that's just overkill. But if I only have an hour at the keyboard, I must assume someone has rudely interrupted me before I even began! Thanks for the update on your fellow Crabbers. It'd amazing how intertwined our lives all were. sister, possibly named Susan? They went to my church, Trinity Methodist. The man had the most gorgeous eyes! I used to tease him that it looked as though he had eyeliner tattooed in between each individual eyelash. Force, was Darden in the Navy??? As usual, I check the website each day. Sorry (hate that word) to hear you were not feeling well. and take care of yourself. You are a very important person to all of us. from you! They most certainly made my day much, much brighter! Thank you, Paul, so very much!